Fenway Group…from the Bullpen: Keeping it Simple. Is that Good? Keeping it Simple. Is that Good? There seems to be dozens of proverbs advocating the wonders of simplicity. From the Quaker song of "It's a Gift to Be Simple" to more modern acronyms like: K I S S (keep it simple stupid), common wisdom would seem to call for human's need to simplify. On a personal note, I am alone (temporarily) for the first time in the past 30+ years for and extended period. A friend inquired as to how I was doing and asked, "It must be simpler?" His assumption, not incorrect, is that being on my own would be simpler than when I'm with my family and balancing other peoples wants and needs along with my own. But along with it came a pang of despair and loneliness. So I asked myself if simple really is better? I think we humans have a much bigger capacity, and desire for complexity than our common wisdom would profess. I think it has more to do with how things which are complex make us feel. In a TED talk I saw John Maeda of RISD uses an example of a sunset like the one below to demonstrate our capacity for complexity. The photo on the left is rather complex; lots of detail to the beautiful sky. The clouds interacting with the light of the sun setting provides a myriad of shades of color, contrast and hue. I simplified the picture on the right. I selected one color and replaced the complex sky with a simple, single color. So, does that mean complex is really better? I don't think it's that easy. Perhaps it's an oversimplification to say that we humans have a large capacity for that which pleases us, and a desire to diminish that which is dis-pleasurable. It seems we have the capacity for both the complex and the simple – a balanced coexistence more than a contradiction. Take these two rather well-known examples of art. 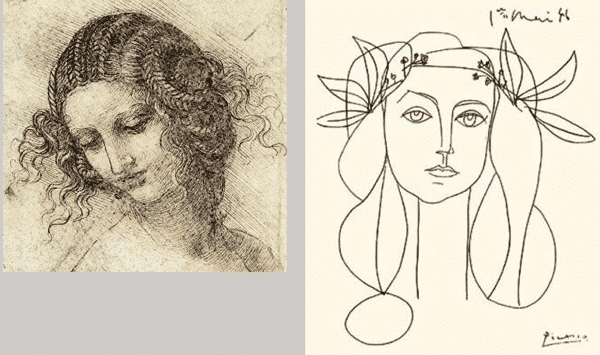 Each is a picture of a woman, but the difference in Rembrandt's style to Picasso's is stunning. Rembrandt's detailed and complex drawing compared to the simplicity of Picasso…is one better? Or a symphony orchestra compared to a single melodic instrument. It's not even a matter of preference, as both can serve a purpose to enhance our lives…the complex and the simple. Copyright 2014. The Fenway Group | Boston. Simple theme. Powered by Blogger.